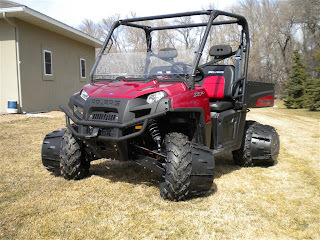 BROOKINGS, South Dakota—Creative Solutions, LLC, has announced the launch of J-wheelz (www.j-wheelz.com), a bolt on wheel attachment for ATV’s, UTV’s and 6-Wheel Vehicles. Through a simple two bolt application, J-wheelz extend the width of the tire providing increased surface area and traction in loose terrain, while remaining free of firm terrain, thus maintaining full steering and speed capabilities of the machine and avoiding unnecessary wear on the product and your machine. Unveiled this February at the industry’s Indy Dealer Expo, J-wheelz offer a patent pending design and a unique material selection which helped earn it a spot in the Top 25 New Products of the Year. J-wheelz are made of a polyethylene copolymer, similar to plastics used in automotive bumpers. Additionally, a closed-cell marine grade foam serves to add flotation to the product. Why these materials? “Creative Solutions, LLC set out to rethink everything, from the shape of the wheel to the materials selected”, states Jake Mills, Co-Inventor of J-wheelz. “With current technology in plastics it made sense to incorporate that into J-wheelz. It keeps the product extremely light yet ensures they are extremely durable. Plus, because of the design and materials, life expectancy will be extended over traditional aftermarket attachments”, states Mills. A universal application allows J-wheelz to fit most ATVs, UTVs and 6-Wheel vehicles. J-wheelz is the first innovative product being introduced by Creative Solutions, LLC. Creative Solutions, LLC was formed in 2007 as a think tank and product launch company. Based in Brookings, South Dakota, Creative Solutions aims to continue their success through the introduction of additional innovative and useful products specifically for the power sports industry as well as other markets.Check them out on the web at www.j-wheelz.com.